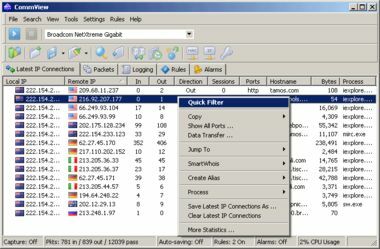 CommView is a program for monitoring Internet and Local Area Network (LAN) activity capable of capturing and analyzing network packets. It gathers information about data passing through your dial-up connection or Ethernet card and decodes the analyzed data. With CommView you can see the list of network connections and vital IP statistics and examine individual packets. Packets are decoded down to the lowest layer with full analysis of the most widespread protocols. Full access to raw data is also provided. Captured packets can be saved to log files for future analysis. A flexible system of filters makes it possible to drop packets you don't need or capture only those packets that you wish to capture. Configurable alarms can notify you about important events, such as suspicious packets, high bandwidth utilization, or unknown addresses. CommView includes a VoIP module for in-depth analysis, recording, and playback of SIP and H.323 voice communications. CommView is a helpful tool for LAN administrators, security professionals, network programmers, or anyone who wants to have a full picture of the traffic going through one's PC or LAN segment. This application requires an Ethernet, Wireless Ethernet, or Token Ring network card supporting the NDIS 3.0 driver standard, or a standard dial-up adapter. CommView features full decoding of the following protocols: ARP, BCAST, BGP, BMP, CDP, DAYTIME, DDNS, DHCP, DIAG, DNS, EIGRP, FTP, G.723, GRE, H.225, H.261, H.263, H.323, HTTP, HTTPS, ICMP, ICQ, IGMP, IGRP, IMAP, IPsec, IPv4, IPv6, IPX, HSRP, LDAP, MS SQL, NCP, NDS, NetBIOS, NFS, NLSP, NNTP, NTP, OSPF, POP3, PPP, PPPoE, RARP, RADIUS, RDP, RIP, RIPX, RMCP, RPC, RSVP, RTP, RTCP, RTSP, SAP, SER, SIP, SMB, SMTP, SNA, SNMP, SNTP, SOCKS, SPX, SSH, TCP, TELNET, TFTP, TIME, TLS, UDP, VTP, WAP, WDOG, YMSG, 802.1Q, 802.1X.